Welcome to the Richmond In Sight store. Working our way through the images in Harry's collection, we find unexpected connections between photographs and stories that beg to be shared. As a result, Kitty has written several books based on Stilson images and oral histories from the neighborhoods in his photographs. 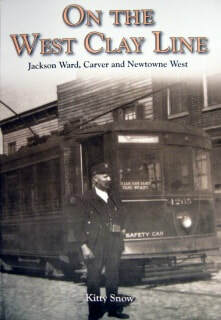 Her second book, "On The West Clay Line," focuses on the ethnically-significant Jackson Ward, Carver and Newtowne neighborhoods with images of Jewish immigrants and African-Americans performing daily activities. “Up & Down Church Hill” includes pictures and stories of Shockoe as well as Church Hill. “From Richmond to France” is the story of Richmond’s ‘soldier boys’ who went to France in World War I in their own words and illustrated by photographs and postcards from the Stilson collection, including color postcards from France in 1932. We also offer notecards so you can share Harry's images when you write to family and friends. Paypal processes our online orders and accepts major credit cards as well as their own accounts. If you want to charge your order to a credit card, please just keep clicking the "other way to pay" button. Within three clicks you are taken to a secure page to enter your credit card information. This is a default setting we can't revise. This isn't a military history. This is a collection of images and stories from Richmond families describing their experiences during World War I. Leon Stilson was a Richmond boy who had never crossed the ocean, Hadn't even been away from home before, and his reflections on life in the army offer insights into pre-war innocence. Images by Harry Stilson & oral histories from Church Hill, Shockoe, & Fulton bring the history of Richmond, Virginia between 1920 and 1950 alive - once again. "The voices you will hear are your neighbors: The man who coaches your children, the woman who underwrites your mortgage. They run our restaurants, teach our students, and paint our walls. They're the children and grandchildren of the people in Harry Stilson's photographs and these are their stories. Page 9, "On The West Clay Line"